1. 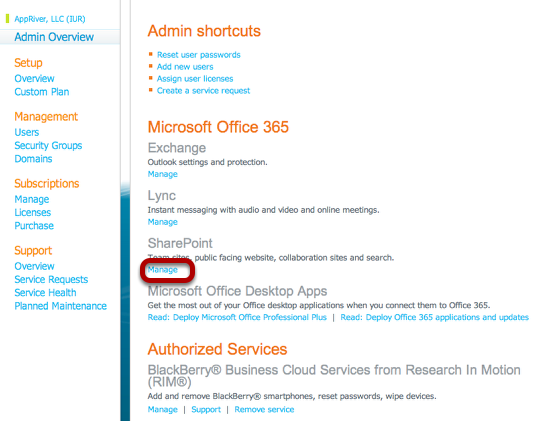 On the Admin Overview page, click Manage under the SharePoint heading. 3. 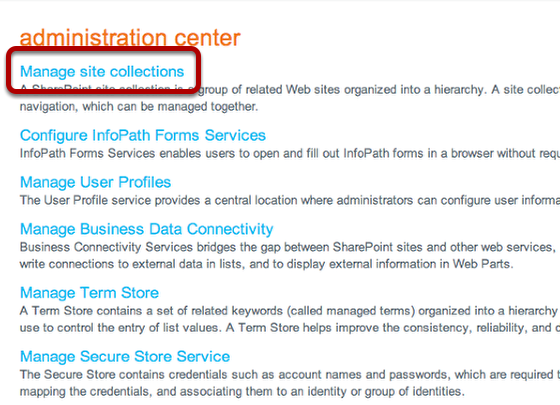 On the Site Collections ribbon, select the check box next to the primary site collection (the main URL of the site). 4. Click the newly displayed Owners menu, then click Manage Administrators. 5. On the Manage Administrators page, set Primary Site Collection Administrator and Site Collection Administrator(s). There are no differences in the rights of the two, but the the Primary Site Collection Administrator is the only one that gets the email notifications about the site. So ensure the Primary Site Collection Administrator is the administrator that will handle the alerts on the site. Click OK when finished.